Arrange spinach leaves on 8 individual serving plates or on large platter. Top each with pear wedges, cheese, onion and walnuts. Drizzle each salad with 2 tablespoons salad dressing. Serve immediately. 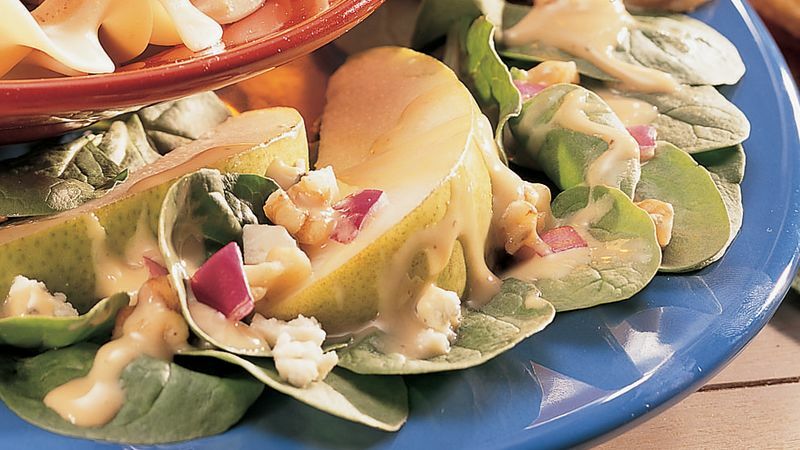 For salads, choose pears that are firm and free from blemishes. Red-skinned pears look especially nice in this recipe. Regular spinach, coarsely torn into bite-sized pieces, can be used in place of the baby spinach. All the ingredients for this salad, except the pears, can be prepared in advance. Place each ingredient in a separate container, cover and refrigerate for up to 4 hours. Cut the pears and assemble the salads when you're ready to serve them.